On the first Wednesday of the month, the Dutch embassy invites Dutch nationals for a drink and, sometimes, a bite to eat. Occasionally, the odd foreigner shows up, today in the guise of Jesper’s (almost former?) girlfriend. Occasionally, hordes of military show up, as today, arriving in two tanks and some 4x4s. And, occasionally, the odd Dutchy, not living in Afghanistan, makes an entrance. And, indeed, today we had some 7 Dutch MPs, members of parliament, amongst the guests. I managed to have a short chat with Corien Jonker, unfortunately in parliament for a moderate right wing party. 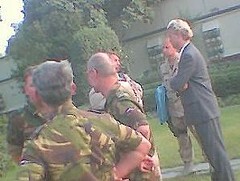 But the infamous star guest of the day was the right-wing politician Geert Wilders. I really wanted to kick him against the shins, but was able to refrain myself from doing so. And then I wanted to ask who is hairdresser is and didn’t get round to it because some Dutch-Afghan started to recite poetry and the Dutch MPs decided to make a run for it.